We often think of the content before we think of the audience and this should be the other way around. 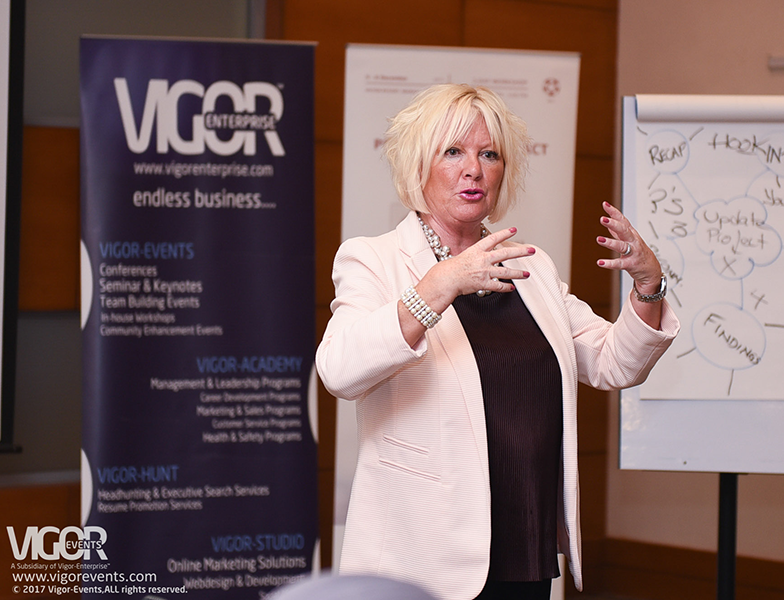 Vigor presented a captivating 2-day program titled Present with Impact that helps leaders to analyze their audience first, by Heather Dallas on the 5th-6th December, 2017 in Burgan Meeting room at Hilton, Mangaf Resort. Based on Heather’s 26 years of experience working with leaders, she shared the best practices for dealing with difficult questions and challenging audiences. The course was full of top tips, tricks of the trade, practice and feedback in a safe environment. Participants were given pre-course work to prepare & deliver a 5 minute non-work and a work presentation in small groups during the program. Heather Dallas has over 26 years of experience as a high impact public speaker & facilitator, she is a qualified MBTI practitioner, Belbin Team Roles Consultant, Emotions & Behaviors at Work Consultant (EQ) and NLP Master Practitioner. This workshop was the finale to Knowledge Club™ 2017 series is organized by Vigor Events and Co-Organized by ALGAS Events Company. Members of the Knowledge Club™ this year included Hadi Clinic as Gold Member, Warba Bank and Kout Food Group as Silver Member and media support from the International Advertising Association Kuwait.